Less than a minute left to go at the end of the 4th quar­ter of the game, and the team is los­ing by 20 points. It’s the sud­den death game of spring bas­ket­ball tour­na­ment, and the moth­ers of the los­ing high school’s seniors cheer on fran­ti­cally, but they real­ize that this is going to be the last time they will watch their sons play at com­pet­i­tive bas­ket­ball game. I am cheer­ing for my team at the top of my lung. My son belonged to his junior high school bas­ket­ball club the entire term, which is from the first month of 7th grade until the end of spring of their 9th grade. He hoped to join the bas­ket­ball club when he entered high school, but unfor­tu­nately his music acad­emy high school did not have a bas­ket­ball team. Although I no longer could watch my son play in official basketball games, I chose to go to his junior high bas­ket­ball bud­dies’ games as much as I could, because, to me, they are like my adopted sons. 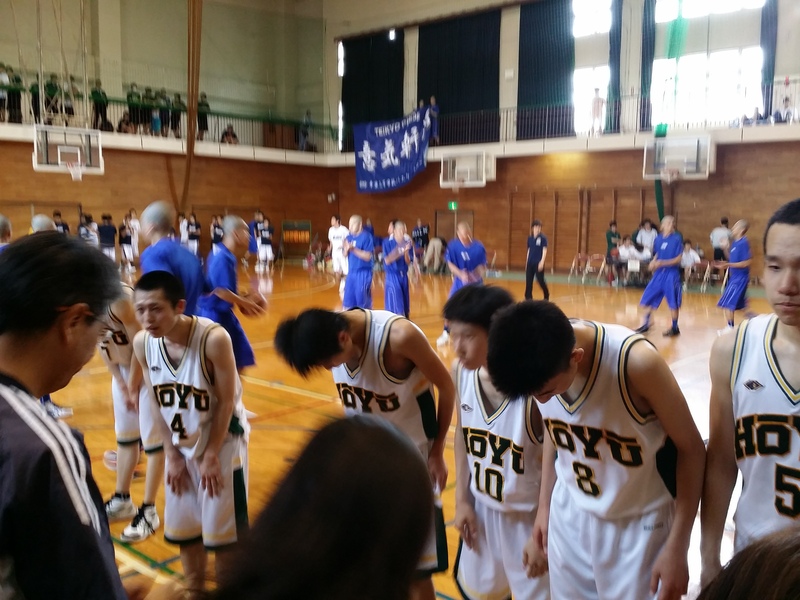 From my obser­va­tion, I think one of the rights of pas­sage in Japan for the past 50 years have been junior high and high school sports club. For a mother, it comes as a shock when their first child joins school sports club and find out they prac­tice 6 to 7 days a week for over two years since they join the club until the day they “retire” at the end of the spring tour­na­ment. After that, their chil­dren start study­ing for high school or col­lege entrance exams in earnest. The stu­dents often will have early morn­ing prac­tice dur­ing the week­days, which means their moth­ers need to get up at 4:30 in the morn­ing to pack lunch, pre­pare a quart or more of bar­ley tea or sports drinks on hot sum­mer days. For a lit­tle over 2 years dur­ing junior high school, and if the child decides to con­tinue on with the sports, in high school, for addi­tional 2 years, on week­ends, rather than going on an overnight fam­ily trip with their child, moth­ers will attend games held at dif­fer­ent schools in the school dis­trict league. Injuries are not uncom­mon, espe­cially with vig­or­ous con­tact sports like bas­ket­ball. Bloody noses, sprained ankles, frac­tured bones hap­pen. Depend­ing on the coach, the expe­ri­ence for both the child and mother are so starkly dif­fer­ent. Bas­ket­ball is a pop­u­lar sport, espe­cially among boys, so most schools have between 10 to 25 club mem­bers, as there are no tryouts. Any­body will be wel­comed into the team. No mat­ter if they have ath­letic abil­ity or not, they had just bet­ter work very, very hard once they join the team. With bas­ket­ball, only five will be the start­ing team mem­bers. High per­cent­age of team mem­bers may play only in a few games, but they are expected to come to all the prac­tice and games on time, and cheer for the team dur­ing the games. The team mem­bers develop very spe­cial bond dur­ing these years. The coach is a dic­ta­tor, and chil­dren learn to obey the dic­ta­tor. If the coach is a good one, then the child will have glo­ri­ous teenage years. If the coach is a bad one, teenage years is likely to be worse. Whichever way, belong­ing to school sports club, espe­cially team sports, will give them huge advan­tage when they enter job mar­ket. With cul­ture of a fol­low­ing order of their supe­rior and work­ing very hard in tough sched­ule, day in and day out, play­ing their role, work­ing within a team, never quit­ting, even when things get tough, are just the char­ac­ter­is­tics Japan­ese employ­ers want. And those char­ac­ter­is­tics that are of prime impor­tance to the moth­ers of chil­dren who choose team sports for their teenage school years too. All these hard work chil­dren, moth­ers, and coaches put in, for the chil­dren and moth­ers, it all ends at the game they lose in the spring of senior year. This year, there are 56 high schools just in the city of Yoko­hama in Kana­gawa pre­fec­ture alone. This means to get to the nation­als level; a team needs to win over seven straight weeks in a row unless they are seeded. With pres­sure to study for mid-term, senior trip, and to start study­ing for col­lege entrance exam, indeed only teams with excel­lent guid­ance from their coaches and clear rea­sons to win will make it past after three weeks. When a team real­ize that they are going to lose their spring tour­na­ment game, just about all seniors begin to cry. You must under­stand. These are young men who have not cried in front of their moth­ers for prob­a­bly a dozen years or more.Â After the game, the team will line up and tak­ing a bow in front of their sup­port­ers who came and cheered for their game, seniors in tears. Some player will run up to their mother in front of their coach, teammates, girlfriends and other teams, they break down and say, I am sorry, I lost. I am so sorry. For some, words do not come out. Moth­ers are already cry­ing. They will com­fort their sons say­ing; you did your best. You did well. Watch­ing it filled me with admi­ra­tion toward both the players and their moth­ers. How strong, how kind and lov­ing these moth­ers must have been to have their sons act this way at the end of their jour­ney, their rights of pas­sage. It is bit­ter sweet. The sons gave their teenage years ded­i­cating them­selves to the sports they chose. They ran a total of 400 miles or more over two years, in un-air con­di­tioned gyms and blis­ter­ing sun in sum­mers and freez­ing cold in winters, as they trained for hours and hours each week. They stuck through it all to the end. Moth­ers are sad for their sons’ loss, but at the same time, they are so, very proud. As a girl, I so wanted to have this expe­ri­ence of a junior high sports club, because I loved sports, and I wanted to join a vol­ley­ball club when I became a 7th grader. I heard about grue­some prac­tice, but it seemed excit­ing, and I was deter­mined to make it through. But it was not meant to be for me. My mother re-married an Amer­i­can, and just before my junior high school years started, we moved to Europe, then to the United States. I was so dis­ap­pointed. With hope, I played vol­ley­ball and ten­nis for var­sity teams in junior high school, then in high school until I had a back oper­a­tion in my junior year, but they never ful­filled me. When I came back to Japan as an adult, and when my first son attended junior high school in Japan, I had all but for­got­ten about my ado­les­cence dream. I did not think much of it when my old­est one quit his junior high sports club. My sec­ond son loved junior high soc­cer club. With my third son who is a talented athlete as well as being a spark igniting player that made him fun to watch, my hus­band and I thor­oughly enjoyed his bas­ket­ball life in junior high school. As his teammates and prac­tice bud­dies from his school and neigh­bor­ing junior high school came over to our house often, they became dear to us, and we became friends with many of their parents. In the past three weeks, I had wit­nessed three teams with the boys I had known go through this last rit­ual of the last game. Some may have been more gifted than the oth­ers, but it seems whether they became a start­ing player or not largely depended on their will to play and the abil­ity of their coaches. Whether they played in the last game or not, they are all beau­ti­ful in their efforts in doing the best they can. Some have grown enor­mously from con­quer­ing uncon­trol­lable events that hap­pened to them through play­ing basketball. I would like to rec­og­nize peo­ple who has given me so much joy and hap­pi­ness for the past seven years. Kaito, you are my inspi­ra­tion. Yuuma, you have real­ized your poten­tial. Ryuno­suke, Keisuke, Abec­chi, Yuuki, Riku, Yusuke, Wataru, Tama, you’ve worked so hard and become so strong. Your time will come again. Shugo, you made it to the next level. Kanta, Kenzo, Shinji, I am deeply thank­ful to you for giv­ing me so much joy and hap­pi­ness. I am so proud of you all! But I must not for­get the par­ents of those chil­dren who became dear friends to me, and the coaches and bas­ket­ball asso­ci­a­tion and school sys­tem that con­tin­ues to enable this right of pas­sage. It is not a per­fect sys­tem, but our fam­ily had received great ben­e­fit from it. A sin­cere thank you to all.